Shot over seven years, DIG! is a feature-length documentary about musicians Anton Newcombe, leader of the Brian Jonestown Massacre, and Courtney Taylor, head of the Dandy Warhols, star- crossed friends and bitter rivals. DIG!’s director Ondi Timoner took away this year’s Grand Jury Prize for Best Documentary at the Sundance Film Festival, with Palm Pictures hot on her heals to pick up the North American theatrical and DVD rights. How did DIG! come in to being? I graduated and had made two films about women in prison in Connecticut America. One of them The Nature of the Beast (1994), about Bonnie Jean Foreshaw, who was railroaded into jail, ended up on public television, which is pretty much where documentaries went back then, and it was clear to me that people weren’t really watching documentaries. I felt the problem with documentaries was that they were retrospective, and so I felt I wanted to make a film where the story was unfolding on camera. So I came out to LA to turn The Nature of the Beast into a TV movie to get Bonnie out of prison and to continue making documentaries, but make them like narrative film. In turning The Nature of the Beast into a TV movie, I was suddenly involved with a major talent agency, which was trying to package it with Queen Latifah playing the lead, while trying to give me a title and get me out of the picture. It became clear that in the face of commercial success or commercial venture, creative integrity is definitely a fragile thing. And in that crux where art and industry meet, art can die – or it can be diluted very severely. 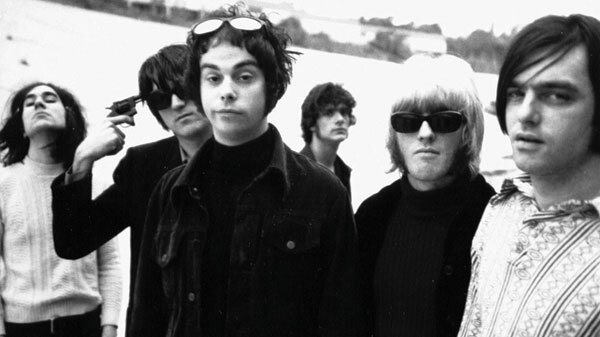 So I began looking at where art and industry meet by looking at 10 bands on the verge of getting signed, when I heard the music of the Brian Jonestown Massacre and it blew me away. It turned out that every label was interested in them, so I went to San Francisco to meet them and that’s the first footage you see in the film. Two weeks later they came down to play an industry showcase in LA and ended up in a fist fight pile-up by the fifth song, and I was just like, “OK, these guys are madmen and whatever’s going on with them and their music and their day- to-day life is more important than any kinda rules the industry has set up; they’re gonna play the game on their own terms if they’re gonna play it at all.” The day after the show Anton Newcombe said, “I’d like you to go and meet the Dandy Warhols; we’re gonna start a revolution together. We’re gonna revolutionise the music industry. Forget about those other bands you’re filming, we’re gonna show you how to do it in your movie.” And I was inclined to believe him. I didn’t drop the other bands right away, but eventually my original idea, The Cut, was ripped off by MTV, which turned it into a game show. I’d brought it to them trying to look for financing and it ended up on TV in a mutated form, so I dropped the project and just picked up with the Brian Jonestown Massacre and the Dandy Warhols, because I realised I could look at everything I wanted to explore about art and industry by looking at these two bands. So many other bands were looking at what the industry might want from them and then trying to be that, whereas both of these bands were just who they were. I thought the Dandys were more likely to get a ticket to ride through the industry than Brian Jonestown Massacre, so the relationship and contrast between them was perfect. So, seven years later we have 1500 hours of footage and quite a tale to tell. Was it always the plan to follow the bands for seven years? No, it was going to be a year originally, but you just can’t look at something like that over a year; things just don’t go that fast. For the first two years we filmed very consistently and a great deal of the footage is from 96-99, and then I slowed down a bit. I also realised that the revolution wasn’t going to happen the way that Anton or I thought it would. About six months into filming, the friendship between the bands started to go sour. I still thought the Brian Jonestown Massacre could make it and the Dandy Warhols were making it, then about three years into it I realised that Anton was too rock’n’roll for rock and was going to self destruct at every opportunity of commercial success. Then I began to look at what success really is. Is it commercial success and would Anton be alive if he was successful? He’s put out 11 records, so he’s a very prolific and alive artist, but he just has to live on the edge. If he had a home and a family life he probably wouldn’t be making this music. Meanwhile, the Dandy Warhols were on this straight-up trajectory, having issues with their record label. The Dandy Warhols’ favourite band is the Brian Jonestown Massacre – they just don’t want to be in the same room as them necessarily. They get a lot of inspiration from them. The Brian Jonestown Massacre became obsessed about the Dandy Warhols at one point, sort of stalking them, writing songs about them, becoming really jealous of their success and at the same time disappointed in them for ‘selling out’, because in Anton’s eyes you can’t really be commercially successful without having sold out: that seems to be his perspective. Arguably, the Dandy Warhols haven’t sold out. They haven’t changed. They’ve just been the Dandy Warhols and the fact that people like them doesn’t mean they’ve sold out. The fact is they’ve just managed to navigated the industry enough to get their music out there. Did you have problems with access? Well, when you film people the camera’s like a mirror, so it’s not a good idea to hold it up when they’re not happy. There were phases like when Anton was into heroin: that wasn’t a good time to be filming. I would get a little bit in here and there, but I was not as inspired to film. It was too sad and hard for me as a filmmaker to not get involved, so I stayed away as much as possible and just checked in once in a while. But at no point did either band tell me not to film. That was an incredible thing about both bands; they opened their lives up to an experiment. Did you let them see the footage? Yeah. 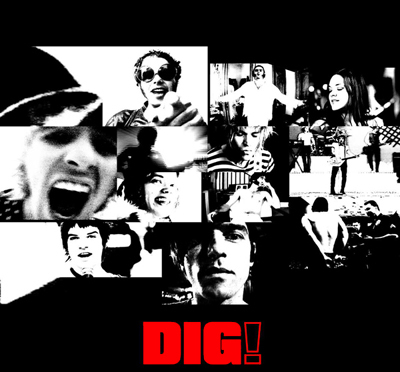 The Dandy Warhols have always been big fans of DIG!. 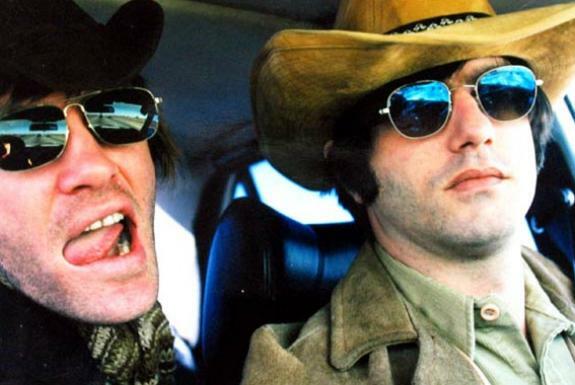 The film is mostly about the Brian Jonestown Massacre, say 70:30, so it’s a fun look for the Dandy Warhols at all the antics and shenanigans over the years of the Brian Jonestown Massacre. Anton never looked at the footage until the end and I think it’s hard for him to navigate, because it has his father, who committed suicide, in it, and then there are incidents where he says things in the movie that he remembers very differently from the reality on the tape. I think it’s a big shock to his system, so I’ve heard mixed reviews from him. What was DIG! shot on? We started shooting the film before there was DV on the consumer market, so we shot about 400hrs of Hi8 with a Sony VX3. Then my camera was stolen at a Dandy Warhols show, so I upgraded to DV with a TRV900, then the VX1000 and finally the PD150. I use the PD150 to this day and I worship the camera. A lot of the movie was shot on that, and a good 30 per cent was shot on spy cameras. I used spy cameras back before reality TV existed, so they were very expensive. Now you can get them for 50 bucks on the internet, but back then it cost me $2500 to buy one spy camera. I needed it because of the low-light, and I didn’t want to use lights because there’s nothing like that to blow a scene – especially when people are a little bit inebriated or in a club at night. So spy cams worked very well for that. We used spy cams and Super-8 primarily for the Brian Jonestown Massacre because they have that gritty, organic feeling that Super-8 brings across. Then once we got some resources together we shot the 16mm film of the Dandy Warhols and then there’s some 35mm in there too from their more hi-end videos, so it’s a real mixed bag. What did you use for post? Avid! I’m an Avid editor, and Angela Strachan, who really believed in both bands and the project, contributed a crucial 20-30 grand in the form of an Avid about three years ago, so the Avid’s been like my roommate since then. People have had to try and pull me out of that room with me just going through revelations editing DIG!. In August all the drives crashed and we lost half the media. We finished the film on 3 October, but there was actually a five hour cut in July, so within 3-4 months we’d slimmed the film down from five hours to 1hour 45mins, but stay tuned for the DVD – its gonna be great. As Joel Gion from Brian Jonestown Massacre said, there’s the potential to make three movies that tell the exact same story using different footage. I couldn’t stop filming because the relationship was so extraordinary and the story just kept unfolding. It’s like the project became bigger than me; I just had to hold on to the seat of my pants and keep going. How hard was it to cut down such a huge volume of footage? Really hard. It was practically impossible to make it happen. Basically I had to spend many, many weeks throwing spaghetti at the wall and seeing what stuck. It was really painful; it’s like killing your babies or something. Someone said, “a work of art is finished not when there’s nothing to add but when there’s nothing left to take away.” I had to throw away stuff as good or better than was on the screen just to stick with the story. There are some antics and choice, choice things, but I had to just let it go. Did you seek guidance when editing? Yeah, Vasco Lucas Nunes our co- producer spent a lot of time in the edit bay with me. He sat with me at length and really worked with me. Then at the very end I showed Doug Pray (director/editor of Hype and Scratch) a cut when it was already down to two hours 12mins, and he helped me take it down to 1 hour 45mins, just by sitting with me for a couple of sessions and making some comments. He has an editorial adviser credit on the film; he was very helpful. I had to finish the film because I was due to give birth that week, so I actually didn’t have the feeling that it was done, because I didn’t have that satisfactory, “OK, that’s it”. We output it and then did a polish before Sundance and cut another seven minutes out of it, and now we have our distribution deal I want to do another polish, not to cut time but just to tweak a few things I saw while at the festival. I don’t think it’s ever done for filmmakers; we’re way more critical of our work than other people. I didn’t raise a budget, I funded DIG! by working as a director. I produced, directed and edited a show for VH1 called Sound Affects; I did a bunch of EPKs and was nominated for a Grammy in 1998 for a piece I did about fastball. Then I did documentaries about Paul Westerberg and music videos for people such as Lucinda Williams. Very low budget music videos, but it was my bread and butter and I would just take my money and make DIG!. I looked for money at different times, but it was such a waste of time because everybody looked at the amount of footage and said, “Well, lots of luck.” Nobody could see the light at the end of the tunnel and I don’t blame them; it was a hard project to complete. The budget was less than a million, but more than $500,000, just because it was shot over so long and there were so many journeys in it. I toured Europe with the Dandy Warhols three times, went to Japan with the Brian Jonestown Massacre and did national tours with both bands, and that costs. Plus a lot of tape, film and transfer costs, and I’ve had to upgrade the Avid and get more drive space for the film. And there’s people I brought on at different points; I brought my brother on to edit for a little while last year, and another editor, Oscar Daniels. I kept trying to hire editors to get the perspective and just direct, but it never worked out; I just ended up having to edit it to the end. It was such a massive project that it was hard for anybody to wrap their arms around it. I was the only one with it the whole time, and had all the pieces of the puzzle in my head. I would literally lie in bed and de-reconstruct the scenes. So ultimately it came down to me being tortured till three in the morning. I would wake up with these epiphanies. One of the final epiphanies was Courtney Taylor doing the narration. I wrote it and then he and I ad-libbed and he went away and did some extra stuff which was great. It just ties the whole thing together having him tell the story. Even when the bands go their separate ways and you don’t see the bands together for the last five years of the film you’re hearing about it from Courtney. And he did know about it and they did follow each other’s stories, even though they don’t share the same space. In the last conversation I had with him, Courtney said “My life wouldn’t be the same if Anton didn’t exist. I would have had a completely different life.” So it’s this star-crossed friendship between the two of them. They are each other’s barometer of success. Dandy Warhols defined commercial success for the Brian Jonestown Massacre and the ability to be a good band and successful, which the Brian Jonestown Massacre couldn’t seem to do, but they defined creative integrity, the prolific nature of songwriting and the ability to ride that edge. As Peter Holmstrom said, “Courtney was either unable or unwilling to ride that edge that Anton seems to ride.” It’s a very uncomfortable place to live, but it’s an amazing place to write music from. I have two documentaries that I’ve been shooting. One I’m shooting in Portugal with Vasco Lucas Nunes. We’re documenting a form of bullfighting that he used to perform, it’s a very rustic form of bullfighting that’s done in Oria on the border between Portugal and Spain. It’s a very beautiful thing, where they don’t actually kill the bull. The second is a film I’ve been doing about a dam in Maui, West Africa that’s threatening one of the oldest living civilizations. I also have a feature-length script called Fortunate Sun that people are looking at, which I wrote a while ago, about a man that spent his life in prison for a crime he didn’t commit here in America. He’s basically like a rock star of the prison system. I’m really interested in individuals fighting circumstances they can’t control. Then there’s another film I would love to make about my father, but I only have the story outline not the script. I’m basically looking to do a feature next. I’ll keep doing documentaries forever, but my next move would be a feature. I also wanna keep doing music videos and a few commercials here and there, because they’re such a shot in the arm for a filmmaker who does something over such a long period of time. I’m very excited cause I have a lot of potential opportunities right now.